I had two major concerns as the day approached for Birthday She-Nanni-gans. My first concern was focused on the remote control car which Mr B and I had purchased for The Rascal, on the advice of his mother, Middle of the Darling Daughters, who said her young son had been able to talk of nothing else except the “monster truck.” Except that when it arrived from the Amazon Jungle, it didn’t look exactly, well, monstrous. If asked to describe it, I would probably have said it was “small but perfectly formed.” Would it, I worried, be a disappointment to my youngest grandson who had been waiting the best part of two weeks for this, the second celebration of his sixth birthday. 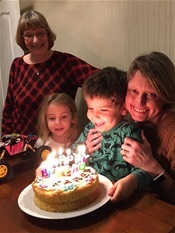 My second concern was how to decorate a birthday cake to appeal to both The Rascal, aged six, and his aunt, Youngest of the Darling Daughters, aged - well, it would be rude to say, wouldn’t it? The baking of the actual cake was not a problem, being as I always - but always - make the same cake, courtesy of the Divine Delia. I did once, to be fair, turn Delia’s Victoria sponge into a dinosaur for one birthday, and on another occasion I covered the sponge in green icing and stationed a number of plastic dinosaurs on top (which the Birthday Boy promptly removed, leaving a cake in the shape of an unappealing green mound complete with marks where the dinosaurs had trodden. Obviously I could not repeat either Cake Related Extravaganza because we were celebrating two people’s birthdays, not one, and in my book both warranted Equal Billing. I wasn’t feeling on top of the world, but (priorities being priorities) I still managed to dress up the Giant Penguin in something passing for party clothes, to haul the plastic table and chairs in from the garage and to wrap up all the presents, including Non-Birthday Presents for the Twinkles after which I turned my attention to the Main Event - as in, the cake. I am sure there are Bake Off Enthusiasts among you, my dear readers, who know exactly what I should have done with my two-in-one cake - but my ideas only ran to ensuring that the cake carried both names and was decorated half with football shirts and footballs and half with colourful butterflies. I will leave you to guess whose half of the cake belonged to whom. The Trio of Rampaging Rascals really, really wanted to go down to the seaside - but it was a proper Windy Miller Day outside and neither Darling Daughter felt I should be braving the elements. So we stayed indoors, where we tackled the latest jigsaw puzzle purchased from the Guild Care charity shop (this turned out to be ten puzzles in one, involving much sorting on the part of the Youngest Darling Daughters and me); stuck sparkly felt shapes onto pictures of a mermaid (Tala) and a unicorn (Lilia) while The Rascal sent his Monster Truck skittering all round the room, giving his Grandad one helluva fright every time it reared up against his armchair. Faris read his latest school book to me - it was all about a stubborn goat who turned out to be an amazingly brave goat, refusing to allow a crafty fox into the stable despite having his toes bitten - and so saving the lives of a number of chickens. I do like a story with a moral, don’t you? Plus the stubborn goat reminded me of Mr B who can be very, very stubborn - but would never, ever allow anyone to harm a hair on the head of one of his Best Beloved. Oh, yes, the Monster Truck was a great success. What I had completely forgotten is that monstrosity, like beauty, is in the Eye of the Beholder. As far as Faris the Rascal was concerned, the truck was exactly what he wanted. Thank goodness. As for the cake, well I was wrong about that too. It wasn’t about my carefully spelt out names, or the butterfly / footie decorations. Don’t be silly - it was All About The Candles. Between the two of them, the Birthday People ( One Rascal, one Darling Daughter) agreed that so long as the older of the two was allowed to blow out the five candles spelling out the word “HAPPY” then The Rascal could blow out the remaining eight candles, as in, those spelling out “BIRTHDAY.” It wasn’t quite equality but nobody was complaining.